Kyle Roper, a New South Wales agronomist has recently discovered that Dow AgroSciences ’ Grazon Extra is significantly more effective than generic herbicides for controlling woody weeds such as Galenia. Galenia which was originally introduced to cover ground disturbed by mining operations, spreads rapidly and is a prolific seeder, that competes successfully against other groundcover and grasses to quickly take over large areas of land. Galenia is classified as a Class 4 noxious weed in regions of NSW, such as Tamworth and the Liverpool Plains, requiring the growth of the plant to be managed in order to reduce numbers, spread and incidence, as well as inhibiting its reproduction. At one of Kyle’s leased properties in Singleton NSW a Galenia infestation was discovered, hindering the sowing of pasture and reducing productivity. Some of the Galenia infested paddocks were treated using a standard picloram and triclopyr based, generic woody weed killer, whilst the rest were treated using Grazon Extra. Whilst the generic herbicide offered “pretty good” results, the Grazon Extra truly excelled. Kyle explains that he applied both weed killers in strict accordance with label instructions, using the same method, application rate and equipment. Kyle says “with 5 litres of Grazon Extra in 200 litres of water per hectare. 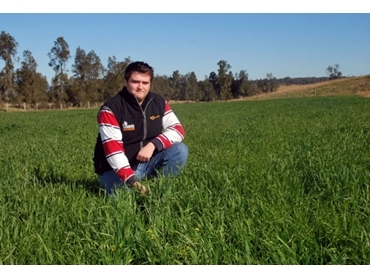 We saw much better results using Grazon Extra, with far less regrowth in the paddock where Grazon Extra was used,”. Kyle is now a convert to using Grazon Extra and will definitely use it to treat and woody weed infestations in future. He says that there are a number of benefits to using Grazon Extra over other herbicides, mainly stemming from the fact that it is effective enough to require only one spraying. More generic woody weed killers tend to need a second spraying, so whilst they may cost less per litre, twice as much product is required, as well as the added expense and time of labour and machines thatthis entails. Dow AgroSciences’ Grazon Extra is manufactured to control a variety of environmental and noxious woody and herbaceous weeds. It is best to treat Galenia at the time of fresh spring or summer growth. Once applied, the herbicide rapidly disperses to the tips of growing shoots and roots, producing a rapid ‘brown-out’, showing where the spray has hit, to help to ensure full coverage in one session.